We are constituted to think and reflect, to query and question, to seek answers and not stop at the answers we find, pushing further and further on our quest for meaning and insight into the big and the small, into first things and last. In other words, we are philosophical creatures. How, then, can we achieve more satisfying, rich, creative, and fulfilled lives as creatures of thought and reflection, as fundamentally philosophical beings? This question lies at the heart of Yoga for the Mind, which came to us in a flash of inspiration after an extended period of reflection and dialogue on how philosophy might be done differently – in an embodied, lived, and life-enhancing way – and, concomitantly, on how we might live more philosophically, more attuned to the spiritual, speculative and ethical, dimension of our being. 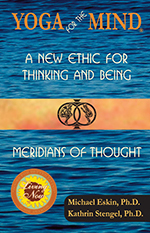 Both an ethic and a method – a spiritual guide to a mentally and emotionally satisfying life and a manual laying out the concrete steps that will take us there – Yoga for the Mind is accessible and speaks to anyone anywhere. 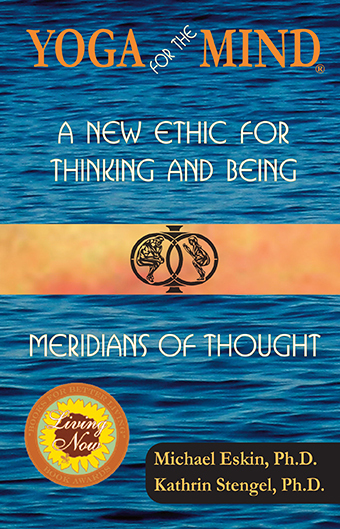 Neither a replacement or substitute for nor an alternative to any of the myriad self- and life-improvement options at our disposal, it is – quite simply – an intensely fruitful and enriching philosophical supplement to the daily diet of existence. It never runs out, is free and accessible to anyone anywhere, doesn’t require professional approval, guidance, and supervision, or interfere with any other activity, regimen, spiritual diet or endeavor, involves no significant time commitment, has no negative side effects whatsoever, and generates palpable results. Kathrin Stengel, Ph.D., cofounder and president of Upper West Side Philosophers, Inc., Studio & Publishing, studied philosophy at the Universities of Leuven (Belgium), Munich, and Konstanz (Germany). She has taught philosophy at Seattle University and the Rhode Island School of Design, and has published widely on ethics, aesthetics, and epistemology, including Das Subjekt als Grenze (The Subject as Threshold) — a comparative study on Ludwig Wittgenstein’s philosophy of language and Maurice Merleau-Ponty’s philosophy of perception. Her book November Rose: A Speech on Death — a philosophical meditation on loss, grief, and survival — has won the 2008 Independent Publisher Book Award. A frequent guest on radio programs throughout the US and Europe, Kathrin Stengel has designed and organized international philosophical events, including ‘What is Space? A Philosophical Inquiry into Space and the Imagination’, ‘About Style: A Philosophical Meditation on the Question of Style’, and ‘On Imagination: A Philosophical Studio’ (all three at the Rhode Island School of Design), as well as ‘Thinking and Experiencing Space’ (Germany), ‘Philosophical Walks with Nietzsche’ (Switzerland), ‘Pain and Beauty in Philosophy and the Arts’ (Seattle University), and ‘Image and Music: Improvisations on the 14 Stations’ for the Interfaith Assembly for Homelessness and Housing in New York City, video documentation of which was on display at the Brooklyn Museum of Art in 2005. For many years, Kathrin has also taught Vipassana Meditation. She lives in Manhattan with her husband and three sons. Michael Eskin, Ph.D., was educated in Israel, Germany, France, Minnesota, and New Jersey, and is the cofounder and Vice President of Upper West Side Philosophers, Inc. – Studio & Publishing, as well as the Vice President of SCALG, the Society for Contemporary American Literature in German. A former Fellow of Sidney Sussex College, Cambridge, he has also taught at the University of Cambridge and at Columbia University. His many publications on cultural, philosophical, and literary subjects include: Nabokovs Version von Puskins “Evgenij Onegin”: Zwischen Version und Fiktion – eine übersetzungs- und fiktionstheoretische Untersuchung (1994); Ethics and Dialogue in the Works of Levinas, Bakhtin, Mandel’shtam, and Celan (2000); On Literature and Ethics: A Special Edition of Poetics Today (2004); Poetic Affairs: Celan, Grünbein, Brodsky (2008); 17 Vorurteile, die wir Deutschen gegen Amerika und die Amerikaner haben und die so nicht ganz stimmen können (under the pseudonym ‘Misha Waiman’; 2008); Philosophical Fragments of a Contemporary Life (under the pseudonym ‘Julien David’; 2008); The DNA of Prejudice: On the One and the Many (2010); The Bars of Atlantis: Selected Essays by Durs Grünbein (2010; as editor). He has been a frequent guest on radio programs and lectures regularly on cultural, philosophical, and literary subjects across the US and Europe – most recently, as a guest of the United States Department of State and the United States Consulate General Germany, The Federation of German-American Clubs, and Limmud, an international organization fostering cross-cultural Jewish education.